Menopause is a natural and inevitable part of every woman’s life, but it’s not exactly something women look forward to. During menopause, your body slowly makes less estrogen and progesterone, and these hormonal changes can lead to mood swings, hot flashes, trouble focusing, difficulty sleeping and problems with sexual arousal. Fortunately, there are things you can do to stave off these uncomfortable side effects. Here are some quick tips and strategies for minimizing menopause symptoms and preventing them from disrupting your life. Feeling moody? Waking up night after night drenched in sweat? Perhaps you’re experiencing random hot flashes that last anywhere from 30 seconds to as long as 10 minutes. These are all common side effects brought on by declining estrogen levels in your body. Isoflavones, which are found in soy and soy-based foods, act as weak estrogens and have been shown to help manage these symptoms. Eating foods like edamame, tofu, tempeh, soy milk and even soy sauce may can help minimize unpleasant hot flashes. If you’re not a fan of soy or find it difficult to incorporate into your diet, look for a dietary supplement that contains soy isoflavones and black cohosh, an herb that has also been found to be beneficial in battling hot flashes. To reduce the frequency of them, try to avoid stressful situations, as well as caffeine, alcohol and spicy food - all of which can trigger an episode. When your bones become weak and brittle, your risk of osteoporosis increases as does your chance of breaking bones. Women start to lose bone mass as early as their mid-thirties, but the rate at which you lose it accelerates after menopause. 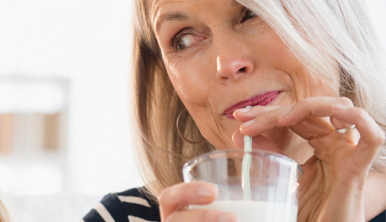 In the five to seven years after menopause, women can lose as much as 20 percent of their bone density, and one in two women over age 50 will have an osteoporosis-related fracture in her lifetime. You don’t have to become a statistic, though: osteoporosis is preventable. Eating foods rich in calcium and vitamin D—such as fish, fruit, vegetables and low-fat and non-fat dairy—can help protect your bones and help fight the natural loss of bone mass that occurs as you get older. Limiting your intake of alcohol, sodium and caffeine is also beneficial. Ask your doctor for a bone density test so you know where you stand. For extra support, look for supplements that contain ample amounts of calcium, vitamin D and other bone-strengthening nutrients like vitamin K, copper, zinc and manganese. Exercise is as good for your mind as it is for your body. Setting and keeping a regular sleep schedule and being physically active are the best ways to counteract the mood swings and insomnia that often accompany menopause. For maximum physical and mental benefits, aim for at least two hours and 30 minutes of moderate activity every week, as well as two days of strength-training exercise. Weight-bearing exercises like walking, running or dancing are ideal, but any activity is better than no activity. Gardening, housework, pushing a power lawn mower, golfing and raking leaves all count as forms of moderate physical exertion, so get it in however and whenever you can.